Fast forward almost 30 years and I am listening to my daughter speak to me about a problem she was having, when it dawned on me that this was for her holiness, and I shouldn't be quick to resolve the problem for her to grant her temporary happiness. That's a tough one though. As parents, we naturally want to see our children be happy. Happiness = the absence of anything that causes them pain or distress or makes them sorrowful (or should I say the parent!). However, how will our kids ever develop true character and virtue; character that goes deep and weathers the storms of life, if we make sure every day is sunshine? 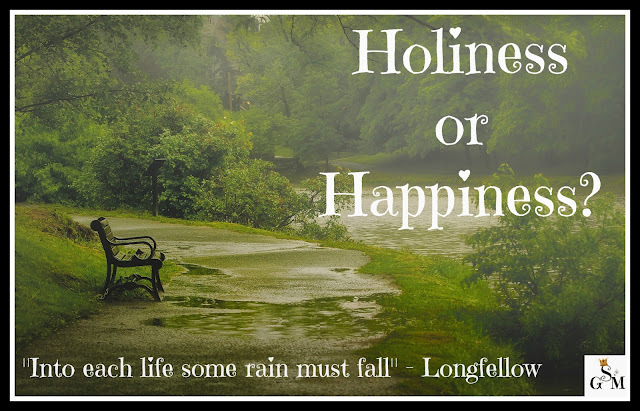 Longfellow said "into each life some rain must fall." He was right, but boy do I want to be quick with the umbrella, galoshes, and rain coat when I see the first raindrop fall! Don't teach them to bail on people or commitments when things get a little messy. Teach them to work through it. Don't teach them it's always someone else's fault by pointing out all the flaws in that person or thing they are having a problem with. It's rarely a one sided deal. Don't focus on making them "happy" all the time. Life shouldn't resemble Disneyland. Confront gently what you see in your child's heart or the true intention behind their complaint or struggle. Making your child aware of their real struggle is a first step to dealing with it and allowing God to work in their heart. Consistency in praying with your child for their own heart issues, and for those involved, if it involves another person. Don't just pray for the other person as if there is no issue in your own child's heart prompting their trouble, it's rarely a one-sided problem. Coach them on right responses to the situation moving forward and how to rightly view their dilemma. Help them to find grace filled responses to their struggle and see the bigger picture of how God is working in their own heart and life, as well as the other person's, through this irritation. So next time you're tempted to pull out the umbrella, galoshes, and rain coat when you see the first sight of rain in your child's life, instead, remember that without the rain we would have no fruit or flowers -nothing to sustain and make life more beautiful. We need the rain as much as we need the sunshine. Their holiness is truly more important than their happiness!